Top » Tools » Polishing » Polishing Machine Brushes » Wood Hub Brush - 2 1/4"
Wood Hub Brush - 2 1/4"
Chungking bristles mounted into hardwood hubs with 1/4" arbor holes for use on the tapered spindles of polishing motors.Genuine Chungking bristle insures longer life & superior polishing action piece after piece. Wood hubs are seasoned hardwood and oil-treated to prevent splitting and guarantee long-lasting service. 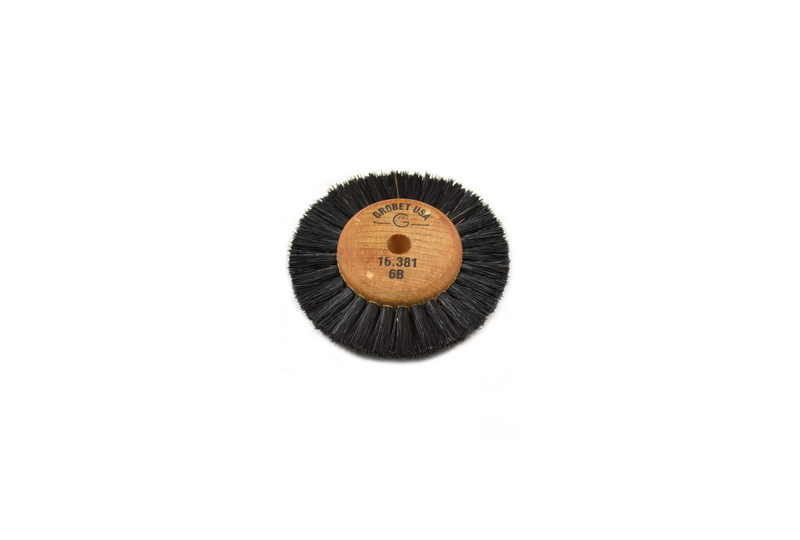 Bristle tufts are staple-set into hubs to remain securely fastened until completely worn down. 2 rows of converging bristle. Hub Diameter - 1 1/4" and Tapered Arbor Hole. Overall Diameter - 2 1/4"